No time to read them all? Worry not there is a Web site called CarryoutText that can turn text into MP3 files you can then listen to on your iPod, Zune, or other portable MP3 player, or burn to a CD to listen to in the car. or you can paste text directly into the converter. After you have made your selections, click Submit to Process. 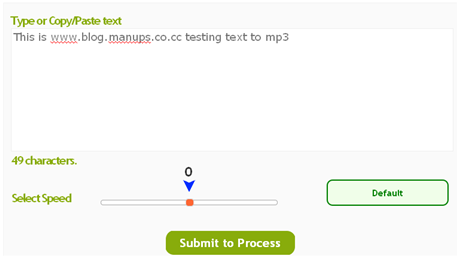 Larger files take a few minutes to convert to MP3 files.A Please Wait screen appeared during the wait. Eventually, a page will appear where you can download your file. Click the big white arrow in the green circle to download it.